Aeration products for managing large bodies of water. Floating lake fountain aerators and land-based air diffusion systems to oxygenate. Otterbine Barebo Inc OASE Living Water Kasco Marine Inc. Lakes, canals and larger water bodies can suffer from water quality issues if these are left to stagnate. Aeration is an important factor in lake management as this will help to increase the dissolved oxygen content of the lake whilst increasing water circulation. Lake Aerators will also help to minimise thermal stratification, mixing the colder base water with the warmer water at the lake surface, therefore reducing algal bloom which can become prolific in warmer, nutrient rich waters. Floating Lake Aerators are ideal for use in deeper water areas but also in shallower zones where stagnant water may be causing water quality problems. Aeration is a great way of improving and maintaining water quality on large bodies of water. There are different principles of aeration which can be used to tackle and prevent a variety of water quality issues, such as stagnation, green water, excessive weed growth and siltation. Dissolved oxygen is also crucial for maintaining a healthy habitat for fish and is particularly good for keeping fish stocks healthy on commercial and pleasure fisheries. Fish like Trout are particularly vulnerable in lakes with little-dissolved oxygen in natural supply, so a lake aerator can often be an essential part of fishery management. 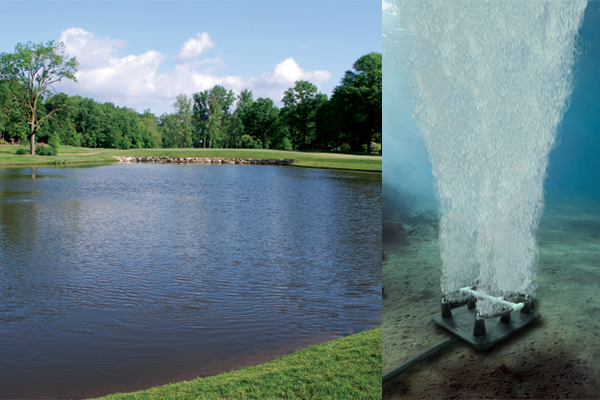 Infused Floating Fountain Aeration is a great all-round method of increasing dissolved oxygen levels. 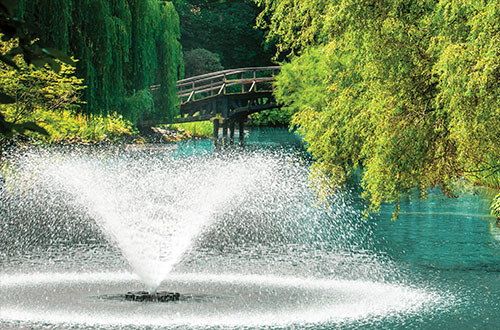 Lake Aerators such as the 5-in-1 Floating Aerator Fountain, draw water up from lower levels, mix this water with oxygen through an open-throated chamber and distribute the resulting oxygenated water over a wide area. This adds vital oxygen to the water and also mixes thermal water layers, cooling the water body and preventing stagnation through thermal stratification. This method is ideal for lakes of most depths and produces an attractive fountain display whilst improving the environmental conditions too. Diffused Lake Aeration is a very discreet method of aerating lakes, ideal if minimal equipment visibility or surface disturbance is desired. The Diffused Lake Aeration System uses a land-based air compressor to supply a high flow of oxygen to air diffusers installed on the lake bed, via weighted lengths of buried air pipe. 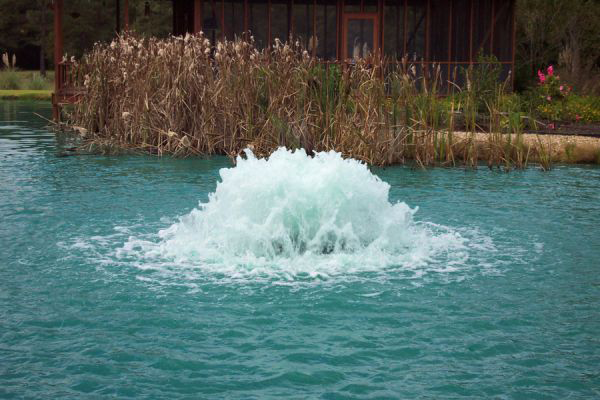 Diffused aeration is a good choice for swimming ponds and lakes as this principle requires no electrical products to be installed in the water. For the same reason, diffused aeration systems are a good choice for use in salt water as the electrical items are protected from corrosion. Diffused aeration is considered a more effective aeration method for deeper lakes and operates less efficiently in shallow water. Injector aeration is a very good way of tackling siltation and sediment issues on the lake bed. 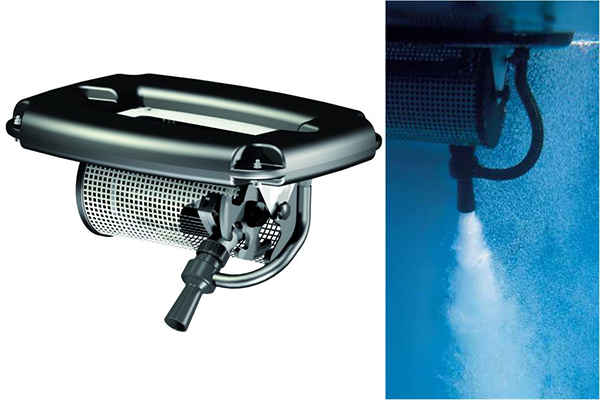 An air injector such as the OASE Aqua Air 250 LM features a large injection nozzle, which can be directed into an established organic biomass on the pond floor. This type of floating aerator pulls air from the surface via a Venturi air pipe and pumps oxygenated water directly into the biomass. This approach disturbs the silt and puts air directly amongst the organic waste, which cultures aerobic bacteria to digest the silt.